Simple Way to Lose 100 Pounds? You are here: Home / change / Can There Be a Simple Way to Lose 100 Pounds? Can There Be a Simple Way to Lose 100 Pounds? Today John talks to Suzy Johnston who finished third in the contest and earned herself a spot on Venus Index Calendar. Suzy’s results from the mid-term contest. What’s even more amazing is Suzy’s overall transformation with Venus Index. 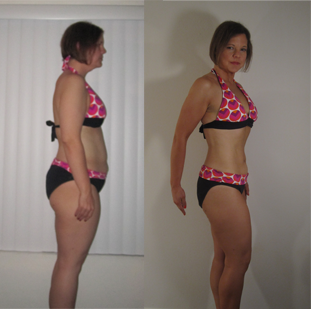 Suzy started at 240 pounds (she is 5’7”) and gradually over 16 months she lost exactly 100 pounds. It’s always interesting to hear where it all started, what was the trigger point for gaining weight, because truth to be told no one is born overweight, there is always something external that trigger’s overeating and thus weight gain. For Suzy it was moving away from her sister. No one was looking over her shoulder, she could eat fast food all the time and binge on it whenever she wanted. Some days, it got really bad. One day Suzy decided to buy a scale and was in shock once she saw that she weighed 240 pounds. This was a turning point for her and she made the DECISION TO CHANGE. She began educating herself about fitness and searched online for weight-loss solutions. However, she had trouble finding the truth. It was hard to distinguish who was right and who was wrong, everybody seemed to contradict one another. Nevertheless, Suzy decided to keep it simple. She started running, lifting weights and eating less. It was at this point Suzy realized that it’s more important to focus on her “ideal” Venus metrics rather than her weight. Is just losing the weight the ultimate goal? You need to think about where you want to be and what you are going to do once you achieve your desired goal. You will always need some kind of goal to keep pushing you forward, otherwise you will stagnate with your progress or even worse, revert back to your old self – this is what’s called yo-yo dieting. So what is your goal? What will you do once you cross the finish line? Sad yet true, most people who lose weight can’t keep it off, they go back to their old self and gain it all back. Figure out your goals in advance and you won’t lose momentum. Be aware that some people treat nutrition as if it were a religion, so it’s better to add this topic to your “do not discuss” list. Some people will label their fitness approach, believe it to be the “best and only” way and then identify themselves with it – e.g. Paleo people. Not only do they think they know better, but they also don’t believe that it’s possible for it to be simple and done without suffering. They will argue with you that it’s very complex, and you have to forego eating foods you like. However, once you get in shape and are the road to improvement they will try to stop you. Now they will question why you want to lose more fat and accuse you of being obsessive-compulsive. Save yourself the hassle and choose wisely who you share your fitness goals with. Many Venus Lifestyle followers choose this “undercover” approach. Suzy finally achieved a healthy body weight and is happy with the amazing progress she has made. For her, it’s just further improvement and she’s already taking it to the next level. What about you? What an amazing story Suzy. What a beautiful transformation. What a great example of what one can do when they focus and have good information to focus on. A good story about the damage all the various diets cause which is what I experienced as well. What a great story. Thank you for sharing it Suzy. Suzy, good lord, woman, you so totally rock! Your story is truly inspirational and you really cut through the misconceptions about what works and what’s just religion and fluff. Oh and kudos for getting John to admit VI is a religion; he’s always maintained it’s agnostic! Anyway, major well deserved congratulations and I can’t wait to see your final photos at the end of 20 weeks! And on the people around you, I strongly suspect that they just need some time for it to absorb and they’ll be asking you questions soon enough. You are about to become very influential!! !